With limited room for subwoofers, ATTYWON had to get creative, using 27 Episode ES-LS-SAT-8-BRN speakers. For NYC-based integration company All The Technology You Want or Need (ATTYWON), a massive 15,000-square-foot home on 2.5 acres with 250 of waterfront on Long Island Sound presented quite the design challenge. The Atlantic Ocean property has no walls, trees or bushes to contain sound or to anticipate sound reflection, just beachfront. The property also has a huge lawn, oversized patio and large pool deck. So what’s to stop the sound from being dissipated over the water, drowned out by boats and other water traffic, or the waves off the Atlantic constantly breaking against the beach? And the design was made even more challenging because the landscape architect did not leave any space for subwoofers to be properly used, but still wanted powerful sound in all areas of the backyard. ATTYWON, based in Manhattan and Long Island, specializes in everything from smart homes to integrated offices. So when Eyal Akler, CEO at ATTYWON, visited the client’s Long Island property, he knew it would be a challenge but was confident he could succeed. “The first and biggest challenge was the size of the property. Our task was to blanket the entire 250-foot width of the backyard with powerful sound. The vast property size and sound-coverage requirements meant long wire runs and a high speaker count,” he says. “There are several tiers between the huge back patio, lawn and pool/pool house area; we had to get ours wires across and through all levels and we worked with the landscape architect to design proper pathways and conduits for our Wirepath direct burial wires. “In such a large space, the homeowner will not always want music playing all over the backyard. In addition, the landscape designer didn’t want the speakers to be too visible, so they had to blend in to be heard, but not seen. We were also concerned about insufficient bass, because neither the landscape architect nor homeowner wanted to provide space for in-ground or above-ground subwoofers, at least not in the areas where they would be most effective,” recalls Akler. From the start, Akler knew this outdoor audio project was going to a challenging install. The homeowner had discerning taste and was looking for ultimate performance. The original design called for 35 speakers and six subwoofers, but after limitations from the landscape engineer and homeowner, Ackler redesigned the system for 27 satellite speakers, with no subwoofers. "While there are over 20 zones of audio inside this 15,000-square-foot home, the biggest challenge was to blanket the exceptionally large backyard with powerful, clear audio." He chose the Episode ES-LS-SAT-8-BRN outdoor satellite speakers powered by Crown CDi amps. The ES-LS-SAT-8-BRN allows for a 60-watt tap at 70V, a feature that is available in the pro audio market but we’re not aware of anything that reaches that level in the custom install market. The 8-inch driver on the ES-LS-SAT-8-BRN, coupled with its higher power allowed for much higher output and compensated for the lack of subwoofers. The speakers have a 120-degree dispersion angle and with the proper settings, they provided enough sound to fill the immense backyard with dynamic full-range sound. Speaker placement played a critical role in this install. Since there was no way of containing the sound at the waterfront, the speakers needed to be positioned for the best audio performance, but still hidden or only partially visible to meet the desire of the homeowner and the landscape architect. The dark brown color and shape of the speakers were ideal for disappearing into the landscape. One of the distinct feature of these speakers is the separate volume control on each; this meant that no matter where you are on the property, you won’t hear sound coming from one specific speaker, what you’re left with is a complete immersion of sound across the property. Akler adds, “We were tasked with covering a large home and property with audio that sounds great and looks clean in its setup. After considering the size and scope of this project, knowing we needed to provide a uniform sound and feel throughout as well as be competitive in our pricing, we selected Episode speakers. While there are over 20 zones of audio inside this 15,000-square-foot home, the biggest challenge was to blanket the exceptionally large backyard with powerful, clear audio. View the slideshow to see detailed pictures of each location! “With over 250 feet of waterfront, a huge lawn, oversized patio and a generous sized pool deck, it was no easy feat. We’ve used Episode speakers in many projects before, but even I was pleasantly surprised by just how powerful and rich the sound quality is. Throw a party for hundreds of people; who needs a DJ!” he comments. Mike Jordan, vice president of audio/video at SnapAV, also commented on the massive project. 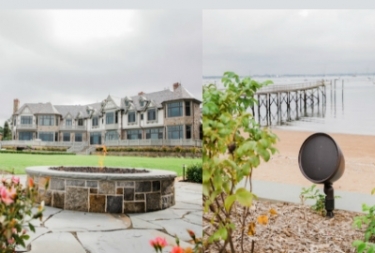 “We designed our landscape speakers to offer the widest dispersion possible, so integrators can provide the best outdoor audio experience for their customers. Because the outdoor coverage area in this project was so broad, wide dispersion mitigates volume hot spot and dead spot issues.